Mushrooms remain a complex and mysterious subject even now, after months and months of research, ponderings, and hair pulling. This book only touches the outer epidermis of the subject, so to speak. I would have preferred that editors had chosen an author who did not pepper page after page with clichés and who knew something about mushrooms to start with or who had gained some understanding from her months of research. This little 160 page 5” x 8” book did not earn a place in my library, nor will I be donating it to the public library. For the first time in my life, I threw the book away. For reasons that I detail below, I do not recommend this book. As a history, the story is garbled, with the author seemingly randomly and repeatedly moving forward and backward through time, randomly and repeatedly moving from east to west, north to south. The book is heavily peppered with quotations from a wide range of sources, but returning again and again to a mycophobic theme. The section “Mushroom Anatomy” beginning on page 16 is as garbled as her history theme. 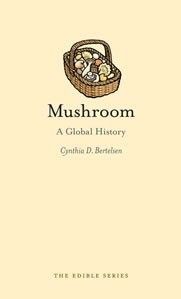 She starts to describe what mushrooms look like, interjects a short paragraph about the water content and chitin content of mushrooms (information repeated at other random places in the book). She mentions that cod appear to be able to digest chitin, then in the next paragraph describes the genus Amanita in a way that implies that all mushrooms have a volva and then mentions clamp connections (but no other microscopic features) as something that can only be seen under a microscope. Certain cultures believe that brightly colored mushrooms are poisonous, and those which are more somber in tone are not; this is proved a fallacy when one considers that species from the Amanita family, such as the destroying angel, are almost sheer white. Some mushrooms glow in the dark, their bioluminescence due to fungal luciferins, chemicals inherent to their biology that result in a phenomenon called ‘foxfire’. (The war journalist George Weller (1907-2002) once wrote to his wife, in a letter penned late at night, ‘Darling, I am writing to you by the light of five mushrooms.’) Never mind that ‘foxfire’ is the glow of Armillaria mellea mycelium and that there are lots of rules for identifying mushrooms that don’t work (indeed she tells the reader other rules that don’t work here and there but never deals with the issue consistently). She has interjected this information between a faulty description of mushroom caps that leads to an abbreviated paragraph about how colour is unreliable for identification and is followed by a discussion of mushroom stems, then mushroom sizes, then mushroom diversity. Misinformation is abundant. Illustrations seem to be randomly selected, sometimes even incorrectly labeled. On page 10, a watercolor of “Agaricus species” is unlike any Agaricus I have ever seen. On page 90, the 25 tiny images in the figure “Psilocybin or ‘magic mushrooms’” includes 5 images of Amanita muscaria, an image of turkey tail polypores, at least three non-hallucinogenic Mycena species, two innocuous Pholiota species and other miscellaneous large and small mushrooms. There was not a single image that I could confidently identify as a mushroom that is likely to contain psilocybin. On page 133, the nine small images above the title “Poisonous mushrooms, beautiful but deadly” does not contain any of the deadly species, and probably only two of the nine images represent toxic species (Amanita muscaria and an image that is possibly an Inocybe species). There are eleven historical recipes and eight modern recipes in the last chapter (pp. 135-146). I would not buy the book just for the recipes. I wish that I could say that the book has any other redeeming features. I certainly did not find them. Review by Michael W. Beug. This review was published in the January-February 2014 issue of The Mycophile.